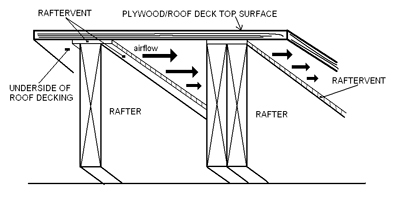 RafterVent is an under-plywood, top-of-rafter vent easily installed during the construction of an addition or a new home. The RafterVent provides adequate ventilation in the spaces to either side of the vent placement. It is a required vent product when your soffit to ridge air flow is blocked by a skylight or dormer. RafterVent easily allows air movement in those trapped areas. RafterVent can also help stop mold and mildew when installed properly. RafterVent is made of a corrugated material that allows air to pass through channels from one side to another. 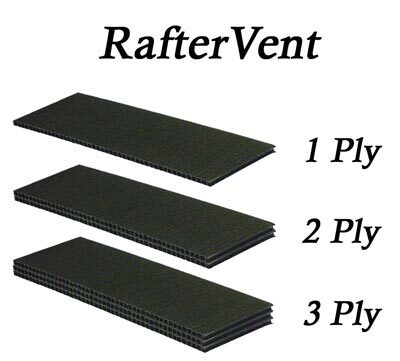 RafterVent works in conjuction with your overall ventilation system by providing the neccessary passages for the transfer of air from intake to exhaust. A great example of one application of RafterVent can be found in an article written by Mike Guertin. If you are unfamiliar with Mike, he is one of the foremost building authorities/columnists in the business.